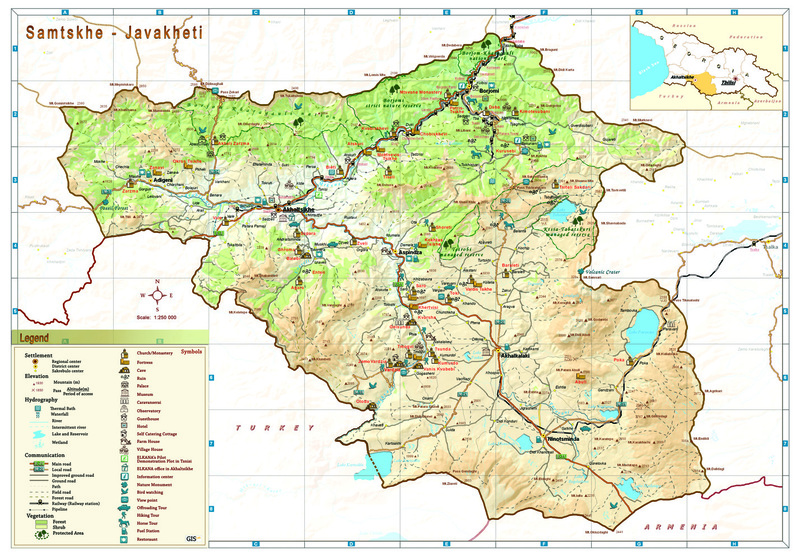 Samtskhe-Javakheti (map) is one of the largest regions in southern Georgia, The total area of this region comprises 6, 421 square kilometres and its capital and administrative centre is the town of Akhaltsikhe. To the north, the region is bordered by Guria and Imereti regions, to the north-east, by Armenia and Turkey, and to the west, by Adjara. The Baku-Tbilisi-Ceyhan oil pipeline and the South Caucasus natural gas pipeline pass through this region. The region is ethnically diverse with a mix of Georgians, Armenians, Greeks, Ossetians and Russians.Samtskhe-Javakheti, historically known as Meskheti, is the oldest historic territory of Georgia. The ancient Georgian tribes dwelled in this territory. Civilization began here some 4,000 years ago. The ancient Georgian tribes of Meskhi (or Moschi) and Mosiniks were the indigenous population of this region, identified by some authors with the Mushki known from 12th century BC Assyrian sources. A majority of the modern Georgian population (Meskhs) of Meskheti are descendants of these ancient tribes. The Mosiniks (or Mossynoeci) were one of the inventors of iron metallurgy. In the 2nd millennium-4th century BC Meskheti was a part of the Georgian Kingdom of Diaokhi, in the 4th century BC-6th century AD - part of the Kingdom of Iberia. In the 10th-15th centuries this region was a part of the united Georgian Kingdom. In the 16th century Meskheti was occupied and annexed by the Ottoman Empire. In 1829-1917 the region was a part of Tbilisi Province (Tiflisskaia Gubernia), in 1918-1921 part of the Democratic Republic of Georgia, and in 1921-1990 part of the Georgian SSR. Since 1990 Meskheti (Samtskhe-Javakheti region) has been a province of the Republic of Georgia. This region was a part of Tao-Klarjeti (occupied by Turkey), where many interesting Georgian churches and monasteries may still be seen. Saint Nino of Cappadoccia, the first Christian preacher in Georgia, entered the country with a holy crosse made of vine stems via the misty mountains of Javakheti, the area where the unique masterpieces of Georgian culture were born. A network of fascinating walking trails has been opened up between Khertvisi and Vardzia.As you travel along the valley Mtkvari, you'll notice information boards showing the 5 marked trails with yellow-and-black paint stripes and arrows in a project coordinated by the Swiss-based Foundation for Sustainable Development in Mountain Regions FDDM), financed by SDC (Swiss Agency for Development and Cooperation).